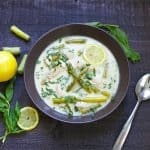 Roasted Asparagus, Cauliflower, and Mushroom Soup combines yummy vegetables with a lemon tang and basil kick! 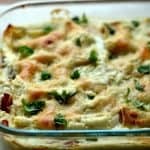 Nutritious, comforting, and a wonderful way to welcome spring time! Happy spring!! I am so excited to bring you guys this delicious bowl of soup on the first day of spring. It’s quite perfect for the weather, really. Can’t tell if we’re going to be warm or cool this week, so this soup fits the bill! I have been patiently waiting for asparagus to be ripe and ready. I love it, and I love all the nutrition it brings to the table. Asparagus packs in the anti-oxidants and anti-inflammatory properties making it one of the absolute BEST vegetables for your body! Want to know what else? It’s even better when it’s IN SEASON. Asparagus is at its peak in April, but I love it all year round. So this soup…… I’m thrilled with the way it turned out! 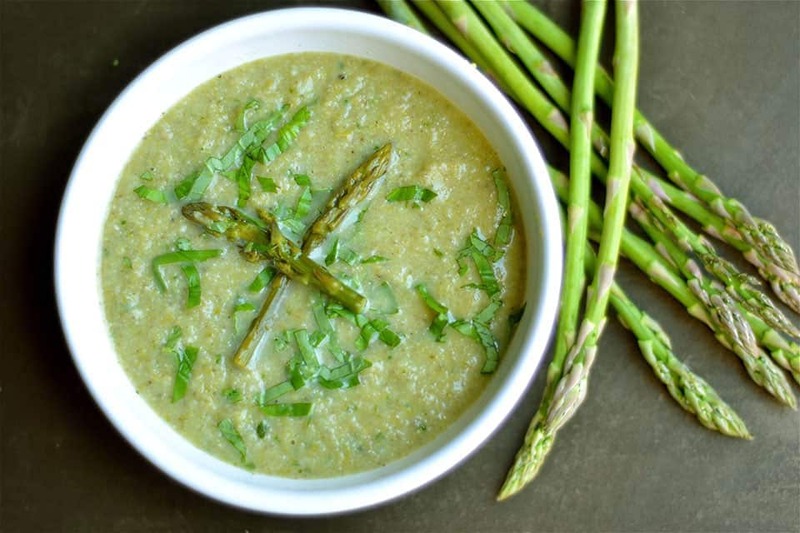 I’ve been wanting an asparagus soup for awhile, and was trying to think of a flavoring combo that was just perfect. 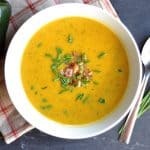 I spent some time playing around with this soup, and am absolutely in LOVE with the way it turned out! The fresh basil really gives it a bold fresh taste, and lemon adds the perfect amount of acid for balance. A quick funny story. So I made this for St. Patrick’s Day; we were celebrating green food and all. My kids don’t love asparagus or mushrooms, but they do love pesto. So I made this earlier in the day, and told them we were eating pesto soup for dinner. They loved it! Had no idea that asparagus was all pureed in there, nor did they ever suspect mushrooms. I topped it with parmesan cheese and some homemade pesto to give it even more of a “pesto” flavor for them. It was super yummy and highly recommended if you have pesto! Prepare the cauliflower and asparagus: chop bottoms off the asparagus stalks and discard, slice the remaining stalks into 2 inch long spears. Chop the cauliflower into florets. 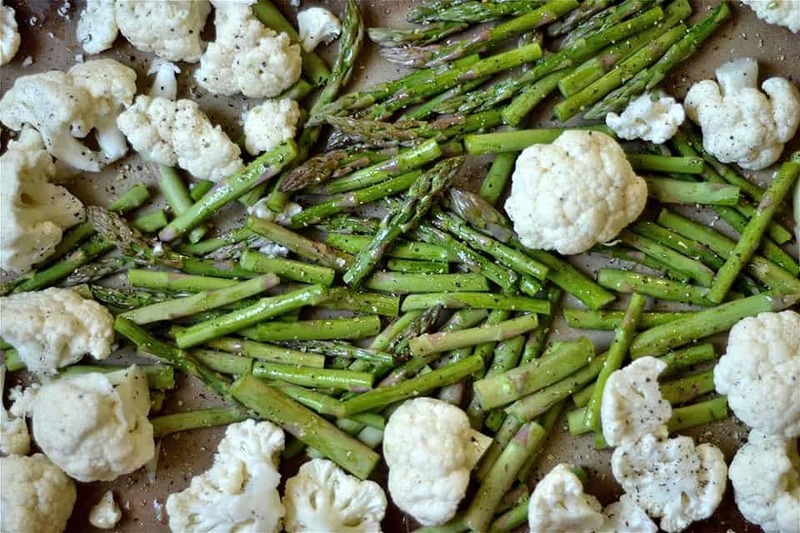 Spread cauliflower and asparagus onto a large baking sheet and drizzle with 1 tbsp olive oil. Salt and pepper. Place inside the oven to roast for approximately 25 mins, gently turning the vegetables halfway through. Meanwhile, heat up a large soup pot to medium heat. Add 2 tbsp olive oil, chopped onion, sliced mushrooms, and garlic. Sauté vegetables for 8-10 minutes, or until flagrant. 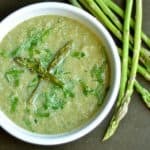 Add asparagus and cauliflower to soup pot. Cover with broth and bring to a boil. Reduce heat to low and simmer for about 10 minutes. Add lemon juice, zest, and basil leaves. Using an immersion blender, puree until smooth. 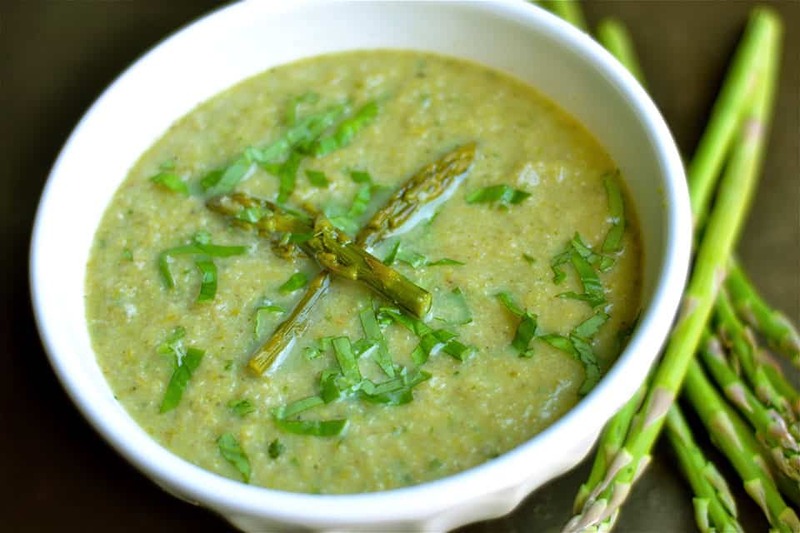 Alternatively, cool down the soup a bit, and pour into a large blender or food processor to puree. 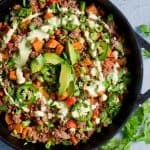 Serve immediately and garnish with any of the following optional toppings. Optional toppings: Parmesan cheese, lemon pepper, pesto, or even pancetta. I used a pretty large bunch of asparagus, but wasn't sure the exact weight. A bundle of asparagus will work! I don’t know how to navigate the site. 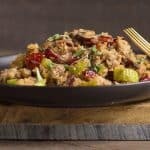 Am looking for a specific recipe that I originally saw on Yummly (Coconut and Pecan Crusted chicken Tenders). Can’t find it. Hi there! Here is the recipe you are looking for: http://www.wholesomelicious.com/coconut-and-pecan-crusted-chicken-tenders/ You can always use the search window and type in the recipe! Or under the recipe tab, then dinner. Hope this helps! 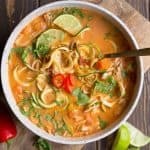 This soup has got all of my favourites in and sounds delicious! Thanks for sharing. Thanks Lucy! Hope you enjoy it!! This soup had a unique flavor. My family enjoyed it, including my 6 year old. It was great to branch out and try something new. Good texture and consistency as well. I followed the directions with the exception of the yellow onion, I used leeks, as that’s all I had on hand. Thanks for the recipe! I randomly came across the recipe since we had cauliflower & asparagus in the fridge. I didn’t know what to expect but our family loved it. Our kids had a friend over and he asked for seconds! I am a pet sitter who has a meal ready for folks when they arrive home. I try to use what they have left that needs to be used. I was searching for asparagus and mushroom soup and found this. Amazingly, I am also making a Sheperds Pie with mash cauliflower top instead of potato. 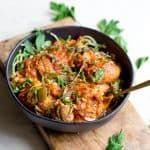 So I have cauliflower – perfect! I’ll let you know how it turns out.